Another shorter event, let’s get to the action. With the kids staying back home, instead of a multi-wrestler opener we get a singles match between a nomad Freelancer and the oldest rookie. It will likely be a more serious match than we are used to seeing in the opener, but still the winner is clear and really it will just be used as more experience for Mimura. Lee quickly gets Mimura to the mat but Mimura applies a wristlock and the pair trade holds. They lock knuckles, Lee gets the advantage out of it but soon they return to trading holds again. A crossbody by Mimura sends Lee to the mat but Lee catches the next one and slams Mimura to the mat. Kick by Lee, she picks up Mimura and throws her into the corner. More kicks by Lee and she puts Mimura in a crab hold, she released the hold after a moment, kick to the chest by Lee and she covers Mimura for two. Scoop slam by Lee and she hits a second one, Mimura slides away from Lee and she delivers a trio of dropkicks. A final dropkick by Mimura, and she covers Lee for a two count. Mimura gets on the second turnbuckle and hits a diving crossbody, she elbows Lee into the corner but Lee hits a jumping knee. Superkick by Lee, but Mimura kicks out of the cover. Mimura reverses the chokebomb into a roll-up, Lee kicks Mimura in the chest and then hits a buzzsaw kick. High kick by Lee, she picks up Mimura and she nails the chokebomb for the three count! Alex Lee is the winner. There really isn’t any way to sugarcoat it, this wasn’t very good. Lee works really light, as was Mimura, so very few of the strikes looked like they had any impact. In a match with a lot of strikes, that was a bit of a problem. Lee is an average wrestler that can be carried to a good match, but Mimura is a rookie so is in a similar boat. This one was missing the young wrestlers for sure to add some flash to the match, overall just a flat way to kick things off. This is an odd match on paper, as these two don’t usually oppose each other. Alpha Female is of course the monster gaijin from Germany, while Yoneyama is a regular Freelancer that is affiliated with YMZ. Why they are wrestling here I have no idea, nothing is really on the line here, but hopefully they will still put on an entertaining match. Alpha Female muscles Yoneyama around until Yoneyama steps on her foot, but that just angers Alpha and she slams Yoneyama to the mat. Yoneyama bridges away from her and hits a dropkick, Alpha rolls out of the ring but Yoneyama goes after her. Yoneyama runs up into the crowd with Alpha in hot pursuit, Alpha catches her and puts Yoneyama in a backbreaker while she carries her back to the ring. Alpha then gets a chair and chokes her with it, while the referee tries to get her to stop. Back in the ring, Alpha clubs Yoneyama in the chest before covering her for two. The beating continues until Yoneyama finally slides away from her, chops by Yoneyama and she knees Alpha in the back of the head. Running senton by Yoneyama, she gets on the second turnbuckle and hits a diving senton for a two count cover. Yoneyama avoids Alpha in the corner and hits a German suplex hold, but Alpha gets a shoulder up. DDT by Yoneyama, she goes all the way up top but Alpha avoids her dive. Lariat by Alpha, she picks up Yoneyama but Yoneyama slides down her back and rolls up Alpha for two. Lariat by Alpha and she slams Yoneyama to the mat, but Yoneyama kicks out of the cover. Alpha picks up Yoneyama again and this time hits the Omega Slam, and she picks up the three count! Alpha Female wins the match. Our first match with Kagetsu has an official member of Oedo Tai! Kagetsu almost by default becomes the #2 wrestler in the heel faction, behind the leader and long time veteran Kyoko Kimura. On the other team, respected Freelance veteran Matsumoto is paired with the talented rookie Jungle Kyouna. This is a chance for Kagetsu to gain some chemistry with her new teammates and also for Kyouna to gain some always valuable experience. 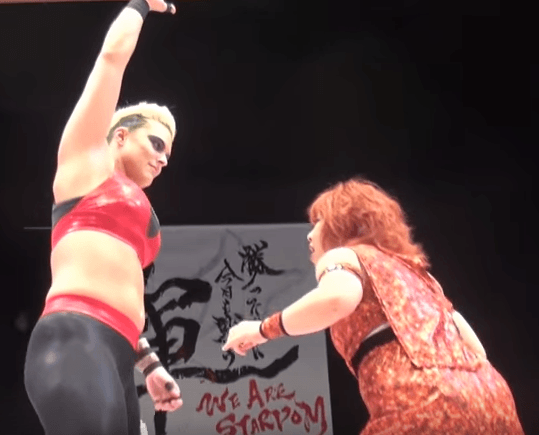 Oedo Tai attacks before the bell rings and they spill out of the ring, with Kagetsu ramming Matsumoto into the ring post before they throw Matsumoto and Kyouna into each other. Kyouna is slid back into the ring and double teamed, Kagetsu comes in as the legal wrestler and dropkicks Kyouna in the jaw. Kicks by Kagetsu and she tags Kimura, Kimura grabs Kyouna and throws her around by the hair. Scoop slam by Kimura and she covers Kyouna for two. Kimura charges Kyouna in the corner but Kyouna moves, Kyouna charges Kimura but Kimura boots her in the head. Kyouna tries to shoulderblock Kimura and finally is able to do so, giving her a chance to tag in Matsumoto. Kagetsu kicks Matsumoto from the apron and comes in the ring, but Matsumoto stacks them in the corner and hits a body avalanche. Matsumoto picks up Kimura and throws her at Kagetsu, she then goes to Kimura but Kimura blocks the suplex and applies an Octopus Hold. Kagetsu handles Kyouna as well, Kimura releases the hold and she tags in Kagetsu. Swandive missile dropkick by Kagetsu and she trades elbows with Matsumoto, Kagetsu goes off the ropes but Matsumoto hits a hard elbow. Kagetsu comes back with a dropkick, she picks up Matsumoto but Matsumoto elbows her and hits a backdrop suplex for two. Matsumoto tags in Kyouna, shoulderblocks by Kyouna and she catches Kagetsu with a powerslam. Sleeper by Kyouna but Kimura breaks it up, Matsumoto puts Kimura on her back, then Kyouna jumps on as well and she hits a double knee onto Kagetsu. Kyouna goes up top and delivers a diving body press, but Kimura breaks up the cover. Kagetsu blocks Kyouna’s lariat and hits a Samoan Drop, Kagetsu picks up Kyouna and she hits a hard elbow. Matsumoto runs in and lariats Kagetsu, but Kimura also runs in and hits Matsumoto with a little bat. Kagetsu gets it to hit Kyouna but the referee grabs it, Kyouna charges them but she hits the referee on accident. Kagetsu hits Kyouna repeatedly with the bat, but she ducks it when Kimura tries to help and Kagetsu hits Kimura by accident. Lariat by Kyouna, but the referee is slow to make the count. 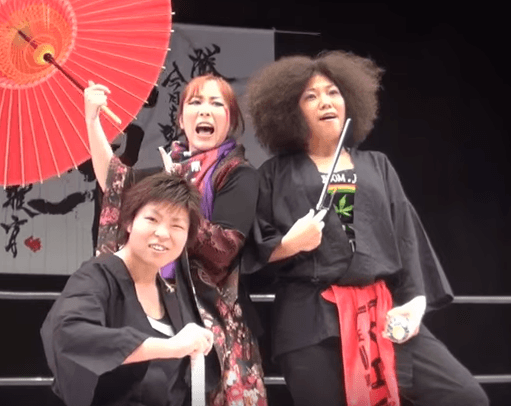 Yasukawa spits Sake at Kyouna and Matsumoto, then Kagetsu and Kimura both boot Kyouna in the face. Rounded Ebisu Drop by Kagetsu, and she gets the three count! Oedo Tai win! The battle of new gaijins! Stardom tends to bring in new foreigners for every tour, and this is both Atenea and Styles first ever tour with the promotion. Atenea has many years more experience than Styles as well as more accomplishments, but Styles plays the feisty underdog well. A good chance for both to show that they belong in Stardom. Wristlock by Atenea but Styles reverses it and hits an armdrag. Another one by Styles and she dropkicks Atenea, elbows by Styles and she hits a running elbow in the corner. Sliding Kick by Styles, but Atenea kicks out of the cover. Back up they trade elbows, lariat by Atenea but Styles fires back with an elbow. Big boot by Atenea, she gets on the second turnbuckle and hits a diving elbow drop for a two count. Atenea slams Styles in front of the corner, she goes up top but Styles recovers and throws her off. Jumping kick by Styles, she charges Atenea but Atenea slams her and applies a Scorpion Deathlock. Styles barely even struggles before tapping out! Atenea wins. There are different methods I could use to evaluate a match like this but none of them would lead to a positive outcome. I would say the quick ending was due to injury of some sort, but both wrestled the following day. Atenea won because she has a title shot at the next show, but why she won with a submission move she had done no setup for I have no idea. Not that the match was going well anyway, the strikes were weak and there wasn’t really any chemistry between the two. Very skippable match. This match is billed as Kairi Hojo’s homecoming, not that Tokyo is terribly far from Yamaguchi but Stardom rarely has events there so its a special moment for young Kairi. This match is unique as Iwatani and Shirai are on opposite teams, even though they are the tag team champions, and thus the Artist of Stardom Champions are on different sides also as Hojo, Iwatani, and Shirai hold those belts together. This probably happened in part due to limited options, they had a smaller roster since this was an ‘away’ event, and to get all the stars on the show they all went into the main. But it should be fun as they have great chemistry together, and Watanabe can hold her own even though she is only 16. Iwatani and Watanabe begin the match, they trade holds and trips but both kip back up. Watanabe goes to tag Shirai but Iwatani runs over and kicks Shirai before tagging in Hojo. Hojo and Iwatani double team Watanabe, Shirai comes in but Iwatani puts her in a crab hold. Hojo throws down Watanabe by her hair, but Watanabe avoids her next charge and delivers a dropkick. Watanabe tags in Shirai but Iwatani comes in too, Shirai flips away from both of them and hits a double dropkick. Hojo and Iwatani fall out of the ring but Shirai and Watanabe go out after them as they fight up into the crowd. Shirai takes Hojo to the top of the auditorium and then kicks/rolls her back down the stairs before they finally make it back to ringside. Shirai rolls Hojo back in and hits a flapjack, handstand into a splash by Io and she tags in Watanabe. Dropkicks by Watanabe and she slams Hojo for a two count cover. Shirai is tagged back in and she knees Hojo in the corner, knees by Shirai but Hojo runs off the ropes and hits a quick spear. She makes the hot tag to Iwatani, Iwatani goes up top and hits a missile dropkick on Shirai. Spinning headscissors by Iwatani, Watanabe runs in but Iwatani grabs her arm and hits a split-legged springboard armdrag. She then dropkicks both of them while they are against the ropes, Iwatani goes back to focusing on Shirai and goes for a sliding kick, but Shirai catches her leg. Hurricanrana by Iwatani and she connects with a back kick, she crawls to her corner and tags in Hojo. Chops by Hojo but Shirai hits a palm strike, she goes off the ropes but Hojo hits a hard chop to the chest. Spinning chop by Hojo but Shirai trips her as she charges and hits a Tiger Feint Kick. Swandive missile dropkick by Shirai and she covers Hojo for two. Shirai tags Watanabe, missile dropkick by Watanabe and she hits rolling vertical suplexes for a two count. Watanabe puts Hojo in the Tree of Woe but Hojo pulls up before she can hit the dropkick. Shirai comes in but so does Iwatani, Shirai puts Iwatani in the same corner with Hojo and Watanabe delivers the dropkick this time. Dropkick by Shirai, kick to the chest by Watanabe to Hojo and she nails the Somato, but Iwatani breaks it up. Shirai comes back in and slams Hojo, she goes up top but Iwatani trips her from the apron. Shirai lands on the Tree of Woe, Hojo goes up top and hits a footstomp on her as she is hanging there. Spinning chop by Hojo to Watanabe and with Iwatani by both connect with sliding attacks, but Shirai breaks up the cover. Iwatani superkicks Shirai while Hojo springboards out of the corner with an elbow to Watanabe. Iwatani dives off the apron to the floor onto Shirai, while Hojo goes up top and delivers the Diving Elbow Drop for the three count! Hojo and Watanabe win! This was pretty much a one-match show. Luckily that one match did deliver, Io Shirai really is the master of the world and the others in the match aren’t too shabby either. Outside of the main though, the other matches ranged from below average to solid but nothing that really needs to be sought out. But I’d definitely recommend seeking out that Hojo homecoming match, it wasn’t in the Top 5 Stardom matches of the year but it was really fun and is worth the watch.